Mavens: The 20% of your customers who actually bring 80% of the responders to every marketing program! Social media influences, or Mavens have a huge market and brand influence! It’s the 80/20 rule – 20% of people who use a product or service bring in 80% of the responders to a program. Take Coca Cola for example: they say that it is not simply about gaining millions of Facebook fans, it is about the community of people that they bring in because of their influence. It is about tapping into the community that these followers belong to. After all, only 20% of Coca Cola drinkers consume 80% of the product. How many re-tweets do you have per day, do you even tweet? What is Twitter, anyways…makes you think, eh? 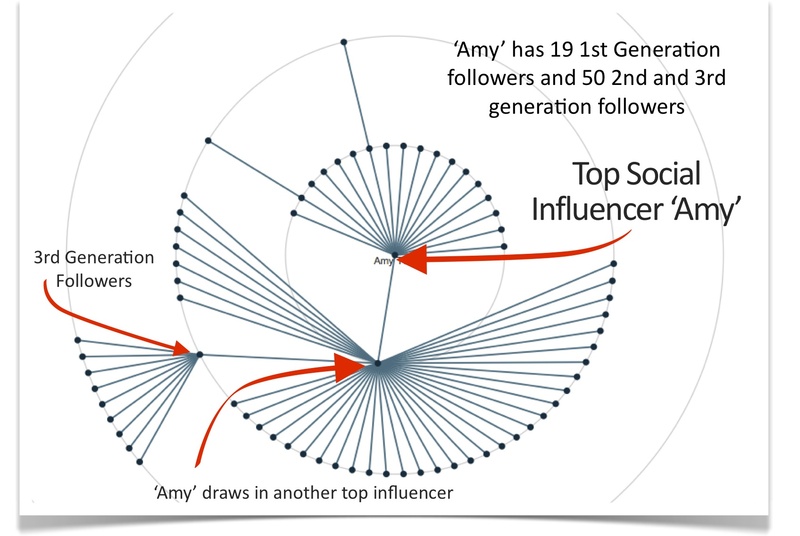 Data provided by WhiteFire: Amy is the brand influencer, influencing the people around her - creating social lift! receives a 1-3 weighted ranking based on Primary, Secondary & Ancillary influencer target status and all scores are then averaged to gauge an influencers potential brand impact rating.” Another tool that is causing a lot of racket is Klout. Klout provides a good starting point for assessing influence online – but lacks the in-depth insight, or personalization for specific brands. WhiteFire Social is a software that personalizes your brand’s influencer data. WhiteFire has a great backroom dashboard that creates spider graphs identifying the campaign’s social media influencers, and the people that they directly influenced to join the campaign, or opt-in. It is a powerful testament to the power of data, data, and more data. Brands are also able to create custom Facebook Apps and follow the campaign cycle from inception to completion, topped off with up-to-the-minute statistics. Software like WhiteFire will only continue to gain popularity as brands attempt to define and measure the impact of their social media influencers. When 20% of people are influencers 80% of the purchasing decisions for a brand, brands can no longer ignore the impact that these Mavens have on the success, or failure of their brand.